We sign peace treaties and make peace accords. We call a truce and then shake hands to confirm our intent. We declare, decree, and proclaim peace. We strive to avoid war, and we work for peace. When we experience peace, we seek to maintain that too-fragile and very precious state. Peace is hard to craft and even harder to sustain. 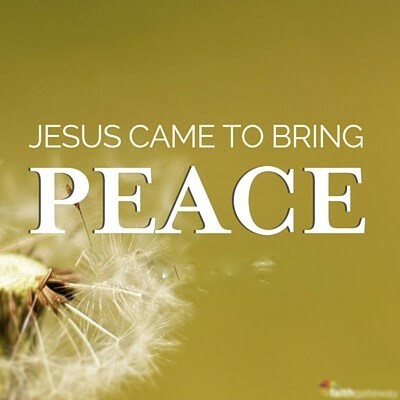 Yet Jesus came to bring peace — peace between sinful human beings and a holy God; peace with others; and peace within ourselves. When Jesus died on the cross, He signed the peace treaty with His blood and ended for eternity the war between humanity’s sin and God’s holiness. Sin has been defeated! Now we can be at peace with God, with others, and within ourselves. We need to confess our sin, acknowledge Jesus’ death on the cross as payment for that sin, and then in gratitude surrender our life to Him as our Savior and Lord. Have you done so? Have you accepted Christ’s peace? Thank You, Jesus, for defeating sin. As skirmishes with sin continue, strengthen me to stand strong in You. Amen.